Fairfax County Police report several shooting incidents in the Reston District this week in which buildings were damaged but no one was hurt. On Monday, a security guard in a building in the 2200 block of Monroe Street in unincorporated Herndon reported hearing gunshots about 10:35 p.m. He located bullet holes in the front door to the building, police said. On Wednesday, an employee of a building in the 2200 block of Corporate Park Drive in unincorporated Herndon reported to police damage and several holes to the front of a building that appeared to be gunshots. 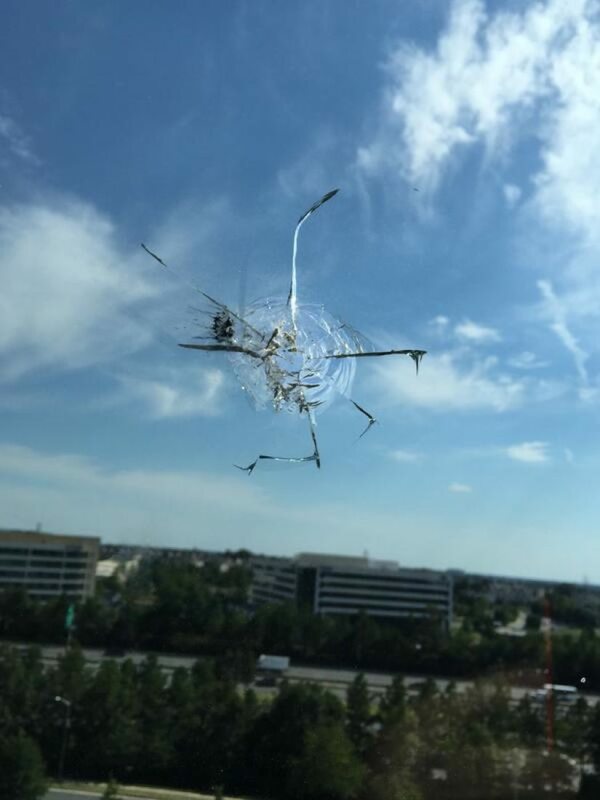 Last week, an employee who works in the 12000 block of Worldgate Drive told Reston Now that his building also was damaged by mystery bullets. Police are investigating to see if the incidents are related. BURGLARY: 11400 block of Great Meadow Drive, Aug. 4. A resident reported someone entered the residence and took property. ASSAULT: 13100 block of Parcher Avenue, Aug. 1. A man was approached by four male juveniles about 1:30 a.m.. The suspects assaulted the victim and fled. The victim did not require medical attention. The suspects were described as males in their teens. One of the suspects was wearing a black T-shirt. A second suspect was wearing a white T-shirt, blue jean shorts and a red baseball hat. BURGLARY: 1000 block of Aziza Court, Aug. 1. A homeowner reported someone entered the home and took property. 2500 block of Fox Hound Court, 2007 Toyota RAV4.